I love heritage homes. The character and custom look of an older home is almost impossible to capture in the newer homes that being built today. The amount of oak and natural woodwork simply can not be afforded by the average home owner. There are so many wonderful aspects of owning an older home, but with the character and beauty come many obstacles as well. Our home was built in 1921 and is approximately 2300 square feet. Our basement is not yet finished and although we still have ample living space, it seems as though adequate storage is a constant battle. Both of the upstairs bedrooms were remodelled at sometime prior to us purchasing our home and they both have the luxury of walk-in closets. However, the rest of the house is limited in closet space and I am always thinking of creative ways to use our space more efficiently. Such was the case with my 2012 closet make over. Tim works shift work and I have always found it more convenient to use the closet in the spare room, so that I can try to avoid going in and out of our bedroom while he is sleeping. 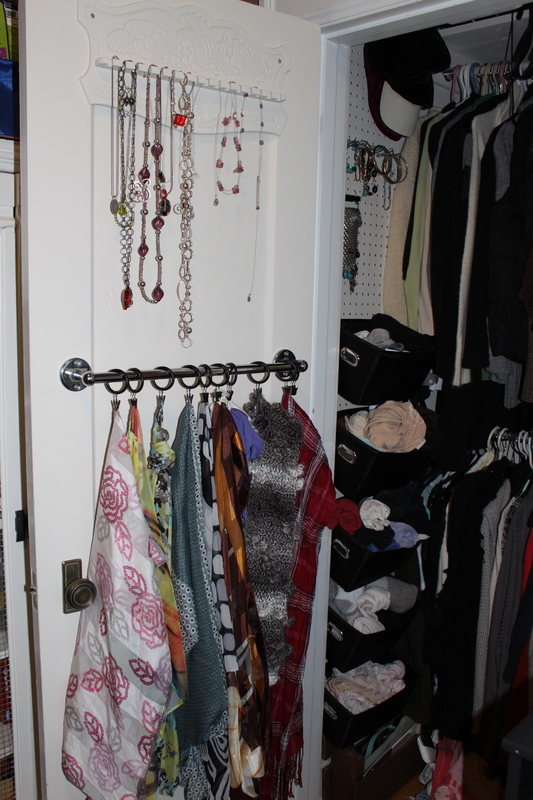 Below is the spare room closet which I use in addition to one of the small closets in the master bedroom (for dresses). 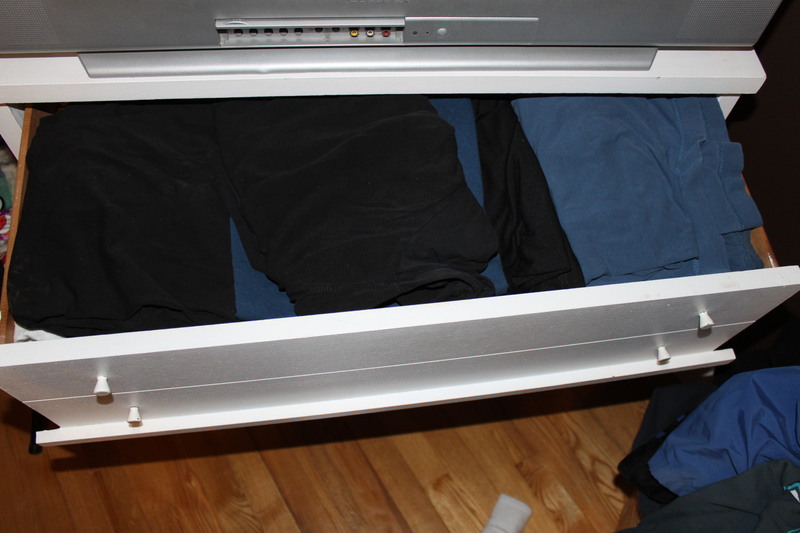 The closet is 33″ wide, 9’6″ tall and quite deep at 33″. The space was being used really poorly, so I decided to embark on my first “build” project without the help of my husband! 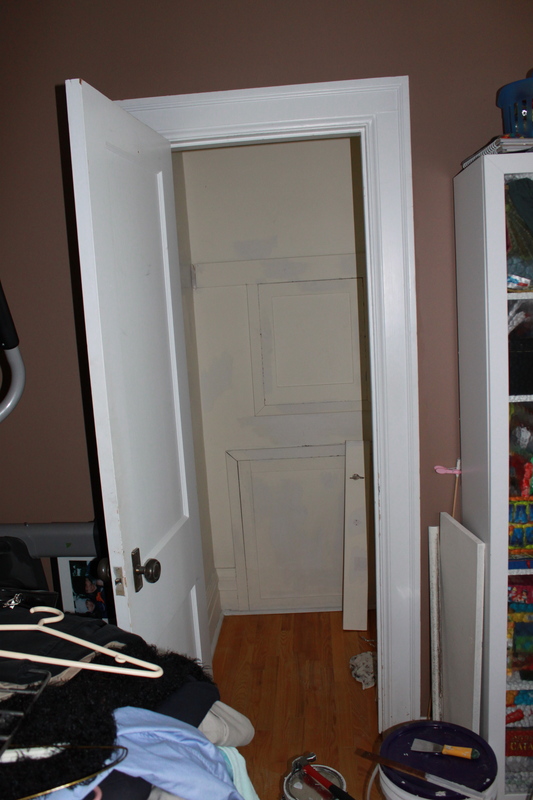 The original closet had one bar going across the closet at about 70″ or so with one shelf sitting on top. All the rest was empty, unused space (other than the pile of junk I had piled up on the floor under the hanging clothes.) Too bad I forgot to take the true “before” picture. It was like one of those closets from a sitcom or cartoon in which the contents of the closet falls out every time you open the door! Anyways, I researched closet make overs and had an idea of what I wanted to do, but had to work up the courage to get started. I am a project queen, but my husband is always asking how and why “my projects” always become “his projects”. I was so fed up with relying on him to make the cuts and use the wall plugs, etc, that I decided that I would learn to do these things myself. What better place to start than a closet, where all of my mistakes and slip-ups can be hidden behind closed doors. I must admit that there was some frustration along the way and my husband notes that he has never heard of it taking so long to mount a few boards, but I literally had to learn everything. I had used many tools before, but my husband would always get the drill bit I needed, find the proper screws, use the wall plugs if needed, etc. I was determined to complete this project without him and at a minimal expense. I had to remove the single bar as the height would not work with my new plan. I had to patch, prime and paint the closet. It was in pretty rough shape and had probably not been painting in decades. I kept it white, but the fresh paint made it look a hundred times better! I then installed “cleats” (I actually know what those are now!!) to support the three shelves and the double hanging bars. My husband was going to help set me up to use the table saw for the shelves, but he was busy and I was on a mission, so I just measured them out and used the electric jigsaw to cut them. They may not be perfect, but they seem fine to me – and I did the cuts all by myself!! Besides, at that height, who will ever see them? 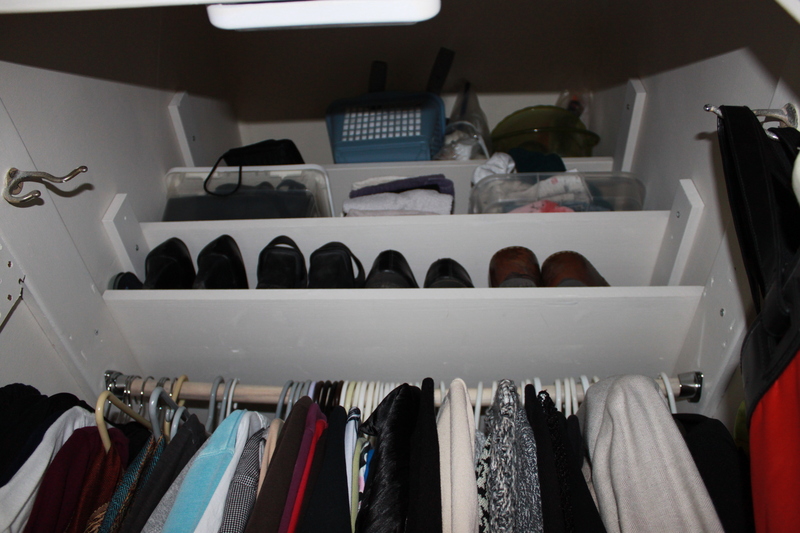 I also wanted to incorporate vertical storage up the front sides of the closet to make use of the empty space there. Old closets are often very deep and there ends up being “dead” space at either the front or back that is often rendered useless. I figured out a way to make this space work for me. I purchased pegboard at the Re-store for $5 and cut, primed and painted it white to blend in with the rest of the closet. I had never used pegboard before and fortunately I was smart enough to figure out that it couldn’t sit flush against the wall or you wouldn’t be able to insert the pegs into the board. I used scrap wood to build a simple wooden frame on the back. (I even mitred the corners.) I then screwed the peg board securely to the wall with long screws, through the wood frame. 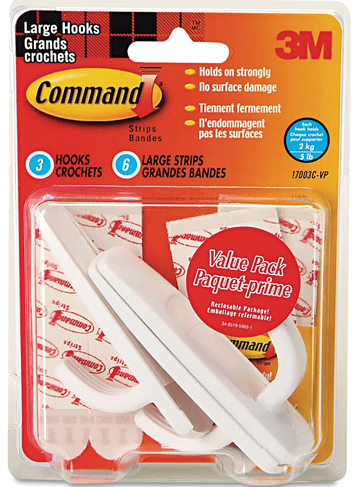 This provided about a 1/2 to 3/4″ gap between the wall and the back of the peg board, so that the pegs would insert properly. I went to the dollar store and purchased several little nylon fabric covered bins (or some kind of fabric similar to nylon). They had cute little handles at the ends and you could tell they were constructed from heavy cardboard (beneath the fabric). I used my We R Memories Hole Punch/Eyelet Setter to punch two holes in the backside of each basket and then set eyelets around the rims to avoid damaging the baskets with the pegs. The eyelets also gave the basket a nice “finished” look. I then “stacked” these vertically along the front of the closet. The fabric tubs line both sides of the finished closet. You can see the eyelet I installed in the back of the basket. I also wanted to use the inside of the door to maximize the space. One of the things I wanted to include was jewellery storage of some kind. I wasn’t sure exactly what I was going to use, but knew I hit the jackpot when I came across an old wooden spoon rack at the thrift store for $2.50. I simply painted it and drape my necklaces over the little rungs originally intended for spoons. It ended up being the most exciting part of the make-over! I added some additional pegs for bracelets and an antique cheese grater serves as storage for my earrings. 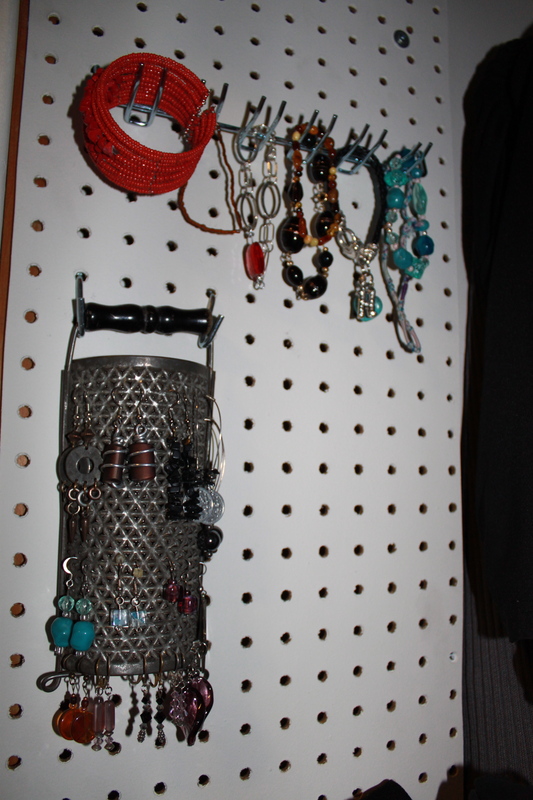 I purchased this antique cheese grater for $3 at The Old House Revival Company (one of my favourite stores) and repurposed it for earring storage. I followed Anna White’s tutorial for making a simple book shelf from a pallet. I love pallet projects as you can generally pick these up for free. I made a few of these and use them for vertical shoe storage. They only hold a few pairs, but take up much less floor space. I made the cuts following her simple instructions and just stained the pallet shelf for a nice finished look. I just added my final addition to the closet last weekend. I was keeping my scarves in one of my black baskets, but really wanted to hang them instead. 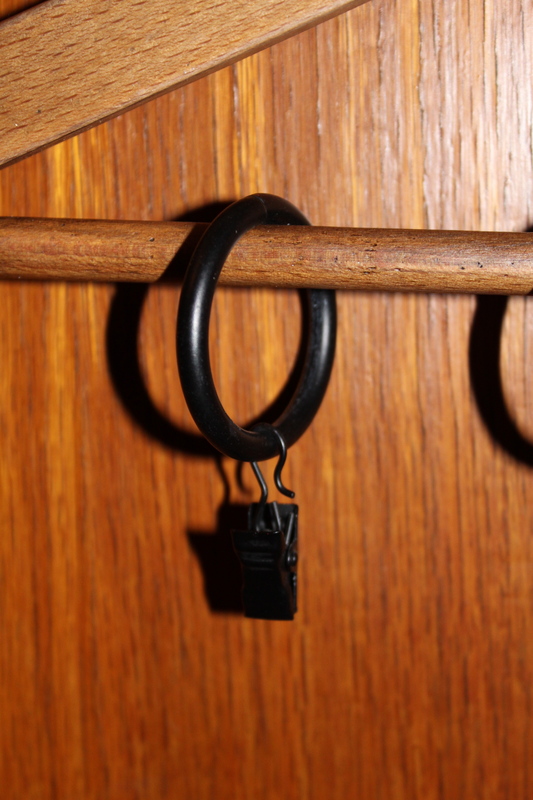 I installed an old towel bar that was being stored in the basement and slid on some old curtain rings that have little clips on the bottom. 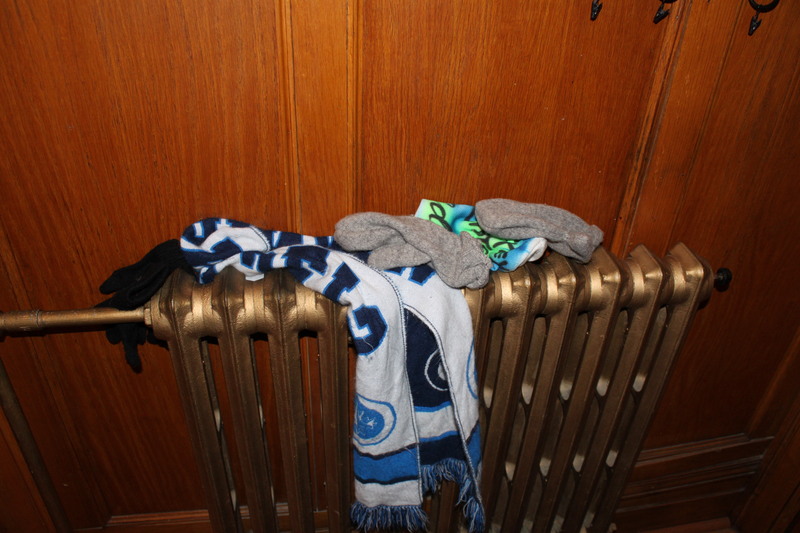 My scarves now hang beautifully and don’t get creased. I have to tell you, this closet is jam-packed! The “new” closet offers double the hanging space, triple the shelf storage, the little baskets hold my socks, underwear, workout gear, and tank tops. In addition, I managed to accommodate more efficient shoe storage, jewellery organization and most recently a great place to hang my scarves. I loved this project not only because the result was great, but because it truly was my very own build. If you look closely there are a few “boo-boo’s”, but you really have to seek them out to find them. Happy organizing! 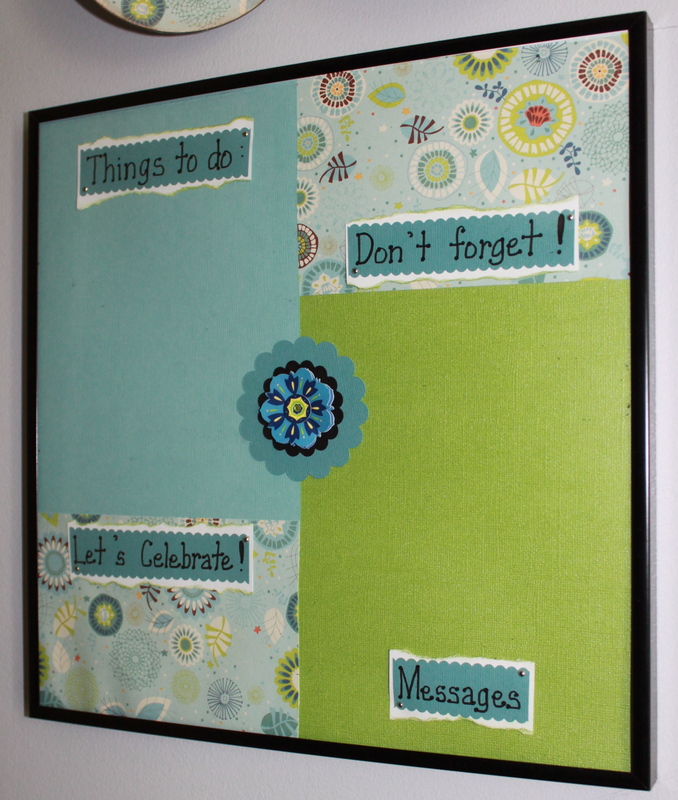 This simple DIY memo board was the final step in our Family Centre project. 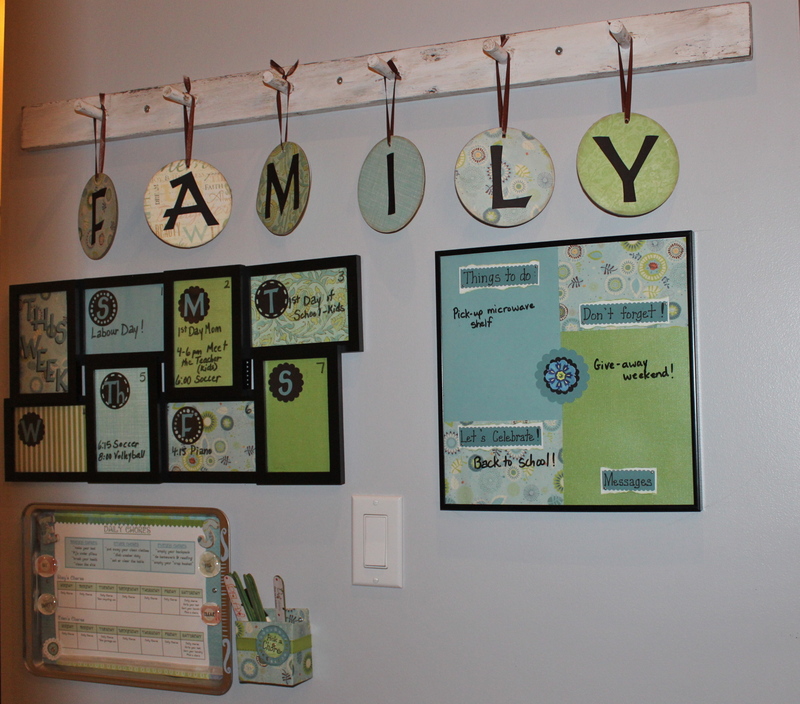 For this project, I used one 12″ X 12″ scrapbooking frame from the craft store and more of the coordinating paper that I had used for the previous projects in our Family Centre: FAMILY sign, Weekly Calendar and the Chore System. I used the paper to create “blocks” for the different sections on the board. It is an easy way to keep track of important things and communicate between family members when we are all going in different directions. I hand printed the titles and double mounted them to create some dimension. I added a little embellishment to the middle just to dress it up a bit. To use the board, you use a dry erase marker on the glass and simply wipe clean with a cloth or tissue. 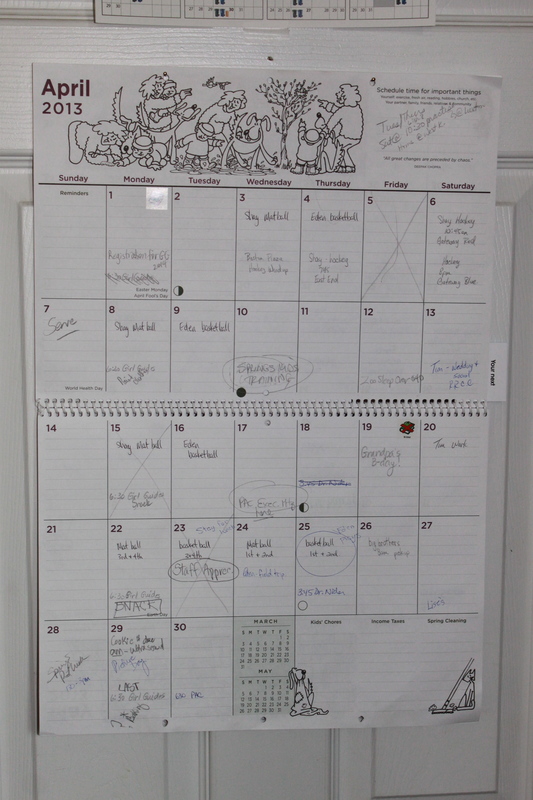 We purchase one of those large family calendars that have ample space for writing. In late August, once registrations have been completed, I sit down and fill-out the calendar as far in advance as possible. Generally, I will complete as much of the calendar as possible leading up to the end of December. I go through the calendar and add in all of the kid’s activities, my activities/meetings as well as Tim’s. Once the monthly calendar has been filled with those commitments that are not flexible, it is much easier to make decisions as to what other things we can commit to and when will work. I am a very visual person and need everything organized and neat in order for it to make sense to me (hence the colour coded system in my classroom). We keep our main calendar inside our basement door which is located in the kitchen. 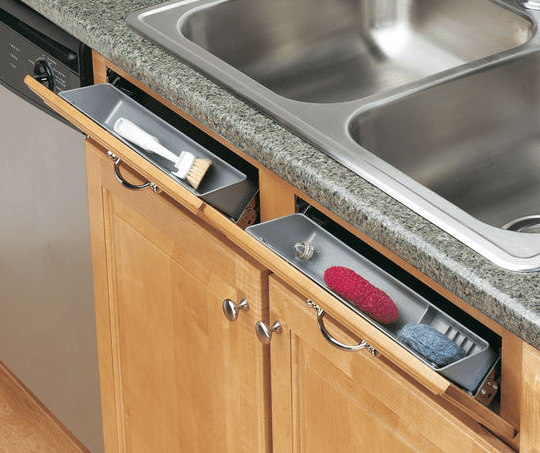 It is very accessible, but hidden so it is not out in the open and messy looking. You can see that the whole family writes on our main calendar. It always becomes very cluttered and full of scribbles as schedules change and adjustments are made. Here is an example of our April calendar. Not one of our busiest months, but still lots to keep track of. Being a very visual person, I like to have a less cluttered version of the monthly calendar that gives us a “week at glance” instead of the whole calendar. Every Sunday, I transfer all of the items from our monthly calendar onto our weekly calendar that is posted on the wall in our kitchen. Like the menu board, the weekly calendar helps to give me an overall look at the week ahead and plan accordingly. It helps my husband and I figure out who needs to be where and which one of us needs to be the “taxi” driver. Here is our DIY weekly calendar. I originally got the idea from Pinterest (not surprisingly) and then made my own version of their weekly calendar. Here is the link to the original source for the idea. This is an easy DIY project and the final look is “clean” and visually appealing. Purchase a multi-picture frame similar to mine. I think I bought this one at Wal-Mart for around $15. You need to have at least 7 frames to accommodate the entire week. I chose 8, but I have seen them done with more frames. 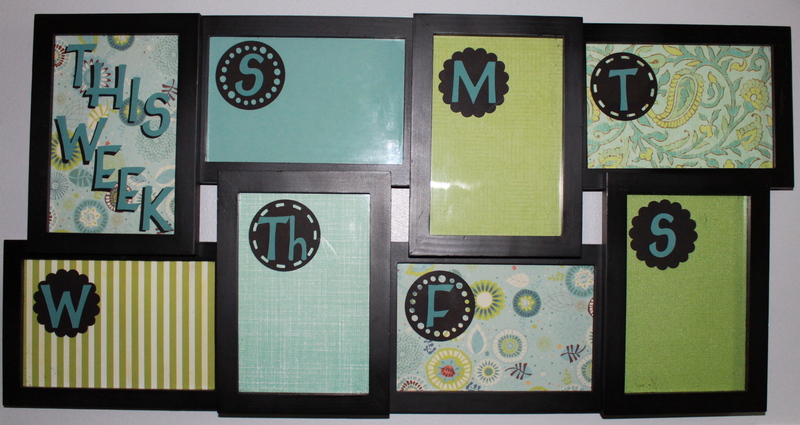 The additional frames can be used for titles (like mine), message boards or just embellished to look pretty. Purchase coordinating paper that will fit with the decor of the space where you will be mounting the finished calendar. 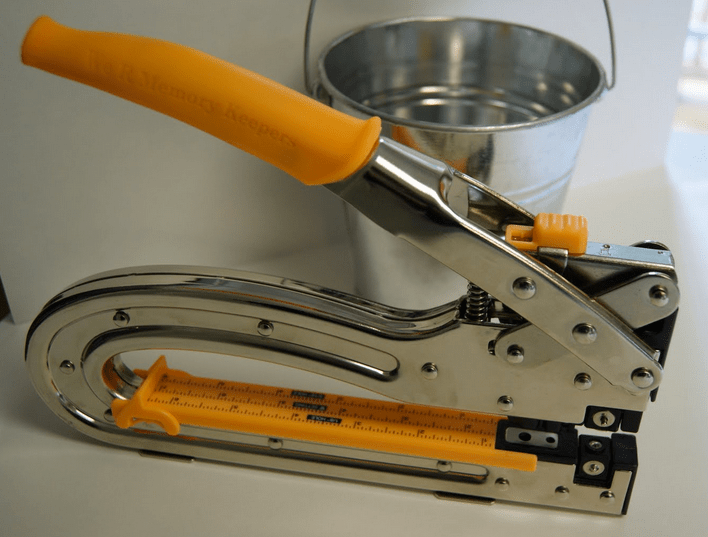 Purchase lettering or use your Cricut to cut-out the letters you need (that’s what I did). I chose to use a the initial letter only, to represent each day of the week. You may want to use smaller letters and spell the whole day. For the title, “THIS WEEK”, I used teal and black. I cut the teal letters on my Cricut, but changed the setting to shadow for the black letters, to make them slightly bigger. 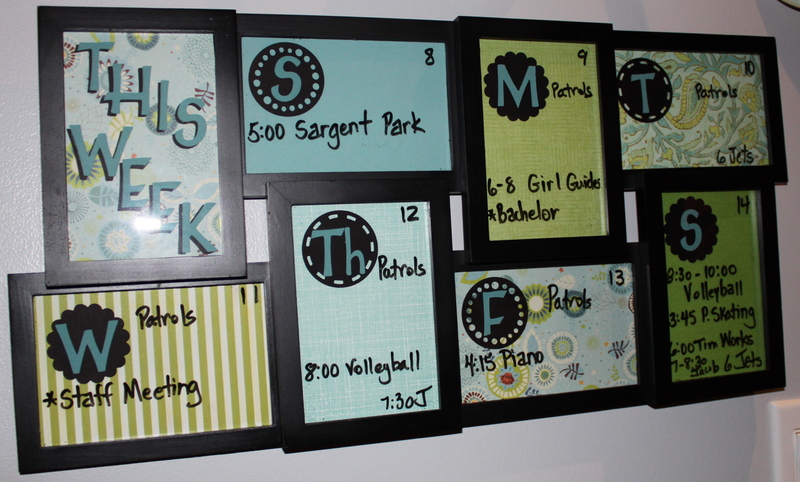 Assemble your frame with your new calendar pages. Use a dry erase marker to print the date (top right corner) and add in your schedule for the week directly on the glass. Use a kleenex, cloth or eraser to erase the board every Sunday and start all over again.